The ActiveWave CF-Card Reader connects directly to a Host computer's Compact Flash port to monitor and control the RF side of the system. 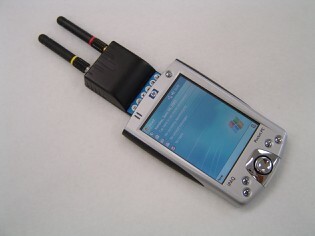 The Host can be a PDA, laptop, Tablet PC, or even a desktop PC. The CF-Card Reader is essentially a minituarized version of the ActiveWave Standard Reader with a Compact Flash connector. Besides the physical size and Host interface, the only other functional difference between the two Readers is that the CF-Card Reader does not have any input contacts or output relays. The CF-Card Reader receives all RFID data transmitted by a tag. It deciphers this data and sends the information in real-time to the Host. Depending on the application, the Host can use this information to control access to restricted areas, quickly find assets in a facility, or update inventory counts in a warehouse. When searching for specific items, the CF-Card Reader can turn on optional tag LEDs and buzzers to make finding items much easier. Along with the rest of our products, the CF-Card Reader was designed for easy setup, configuration, and use. When the Reader is connected, it will automatically be recognized be the Host. When the Host application sends a general reset command to the Reader, the Reader will respond with a power-up message to the Host. This message contains the Reader's address which can be changed by the user. Optional colorful LEDs on the CF-Card conveniently indicate the Reader's operation at all times.